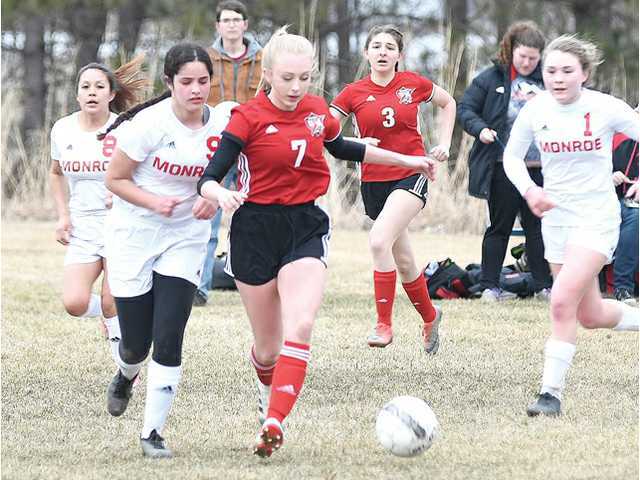 POSTED April 4, 2019 10:06 a.m.
PLATTEVILLE — A year ago, Monroe ended the Platteville/Lancaster girls’ soccer season with a 2–1 victory in a WIAA Division 3 regional semifinal. Friday afternoon, coach Brandon Pink’s Hillmen got a bit of revenge, blanking the visiting Cheesemakers 5–0 in this year’s season opener. Freshman forward Izzy Condiff scored less than four minutes into her first varsity match on an corner kick assist from senior co-captain Sierra Hooper to open the scoring. Condiff added an unassisted goal in the 73rd minute to make it 4–0. The freshman dribbled 40 yards toward the Monroe net before finishing the solo goal with a chip shot over the keeper. Hooper scored unassisted in the 32nd minute when she snuck a shot in at the near post from a tight angle. The Hillmen closed out the first half when junior Alexis Thompson finished off a nice team attack with less than a minute left in the opening half. Hooper was credited with the assist on the play. Platteville junior Aubrey Swenson scored off an assist from Lancaster senior Lydia Murphy by hitting a 25 yard shot over the Monroe goalie in the 83rd minute. Platteville/Lancaster outshot the Cheesemakers 27–2 in the victory. The Platteville/Lancaster defense, which was led by Abby Whitford, Briannon Richards and keeper Leah Hammill, held Monroe without a single shot on goal. “We are executing really well in a number of areas, and ahead of where I thought we would be this early in the season,” said Pink. “I thought our defense and midfield were in sync the whole game. Our positioning and ball movement allowed us to control the match and dictate the tempo throughout. Our forwards also did a great job of finding the back of the net. That was something we struggled with last year. We would create lots of opportunities but fail to finish. I also liked our aggressiveness and passion. The girls looked like they really wanted it, and they did a great job of winning the physical battle. That’s something we need to keep doing. The Hillmen will open Southwest Wisconsin Conference play Thursday night at Galena. They will then host Wisconsin Heights Friday in a non-conference match before hosting Sugar River on Monday. First half — P/L: Izzy Condiff (Sierra Hooper) 3:53, Sierra Hooper 31:46, Alexis Thompson (Hooper) 44:06. Second half — P/L: Condiff 72:57, Aubrey Swenson (Lydia Murphy) 82:13. Saves — P/L: 0; M: Kyla Ziolkowski 11, Maggie Curtis 5. Shots on Goal — P/L: 21, M: 0. Corner kicks — P/L: 16, M: 2.